(From Nikon literature) The Nikon AF-S TC-20E III effectively doubles the focal length of select lenses, and is the world's first teleconverter to feature an aspherical element to virtually eliminate coma and other aberrations even at wide apertures. The following lenses may be used with the Nikon TC-20E III, some with noted functional limitations. NIKKOR lenses not listed cannot be used with the TC-20E III. The rear elements of NIKKOR lenses not listed can contact and damage the Teleconverter element and must not be attached! List includes current lenses along with lenses for which production may have ceased. Lenses that are no longer in production are shown only for your convenience as a compatibility reference! 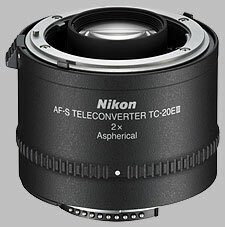 For additional information about Nikon Teleconverter compatibility and/or functionality limitations, refer to the documentation packaged with the NIKKOR lens and/or Teleconverter, information provided in Nikon roduct brochures or call Nikon Technical Support, toll-free at 1-800-645-6689. 25 March 2010 Update: I have added my results of testing the TC-20EIII with the 400mm f2.8 VR to both the Executive Summary below and the longer review found on my website. My copy of the "new" 2x teleconverter from Nikon (the TC-20EIII) represents a dramatic improvement over its "Series II" predecessor (the TC-20EII). This means that the output using the two TC's went from virtually unacceptable (with the TC-20EII) to completely acceptable (with the TC-20EIII) for virtually any use. With all lenses tested with the new TC images were visually slightly less sharp when shot wide open (at maximum aperture size) compared to when stopped down by a single f-stop. In most cases, and with most lenses tested, stopping the aperture down further resulted in only very, very minor increases in sharpness. Both image contrast and colour saturation shot with images using the TC-20EIII showed only marginal reductions compared to when NOT using the teleconverter (while the previous model of reduced image contrast and saturation quite dramatically). I experienced the best image quality, and highest overall "usability" of the lens/TC combinations when pairing the TC-20EIII with "f2.x" lenses (the 70-200mm f2.8 VRII, the 200mm f2 VR, the 300mm f2.8 VR, and the 400mm f2.8 VR). However, I was able to produce very acceptable results when using the new TC with selected f4 lenses (the 200-400mm f4 VR and 600mm f4 VR). Autofocus speed (including initial focus acquisition and focus-tracking on moving subjects) was only slightly impaired on the f2.x lenses. Despite Nikon's claim that autofocus does NOT work with f4 lenses, I found that autofocus did work (albeit in a reduced capacity) on both f4 lenses tested (but was accurate and efficient only using the more central of the D700's 51-focus brackets, i.e., autofocus with extreme outer focus brackets was completely inefficient or failed outright). In summary - and to be brutally honest - I found the best use of the "old" TC-20EII was as a paperweight. In stark contrast, the new TC-20EIII is a useful photographic tool that has earned a permanent space in my gear bag.